All across the Iberian Peninsula and its largest region Andalucía there are hilltop fortresses and look-out towers legacies from the Moors. Bridges, viaducts and monuments are the landmarks from The Romans and narrow winding city streets from the Jews. With so many historical sites to explore here are some of the medieval castles found throughout Andalucia. In the northwest of Jaén and to the east of the Sierra de Andújar Nature Reserve is the Historic-Artistic town of Baños de la Encina with its impressive castle, Burgalimar. 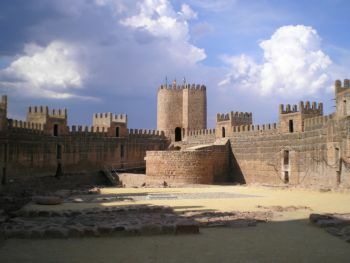 This is a huge oval shaped castle with 14 towers of equal height sitting in state above the River Gualdalquivir on one side and keeping watch on the natural pass from craggy rocks of Despeñaperros to the north, which in days gone by was the natural gateway into Andalucía and as such a prize possession. The origin of Burgalimar began around the year 968 when the Moorish king Al-Hakam ll ordered construction on this fine spot of a watchtower and defense fortress. It was also protection for his Berber troops who were involved in defending their lands from the continuing onslaught of the Catholic Kings. It´s an awe-inspiring size, almost desolate inside with works being carried out occasionally, but a great venue for summer night events under the clear starry nights of Andalucian summers. Carmona is in the middle of Seville province and not far from the city. Rich in history and monuments, wander up the main street and it´s the Alcázar that leaps out and dwarfs the town. Sitting happily in the river valley of the Guadalquivir its origins go back to Neolithic times. Vestiges of Phoenician and Carthaginian eras are dwarfed by Roman changes then five centuries of Moorish rule before being claimed by The Catholic Kings in 1247. It´s well worth the two euro entry fee to explore these well conserved ruins and see the views across the plain where the enemy would have advanced and the town streets below with its skyline full of other historical monuments. The well conserved monument also houses the oficina de turismo, so is a good starting point to exploring the town. It has that effect on people. One visit is not enough. The Alhambra conjures up dreams of days gone by, especially if you´ve read Washington Irving´s ´Tales of The Alhambra.´ Irving wrote the stories and legends about The Alhambra that he gained first hand from the time he spent in Granada. Built at the confluence of two rivers, 792m above sea level and just a few meters from the Sierra Nevada National Park, where the Moorish kings spent a lot of their time hunting, the Alhambra is the third and last of the great alacázares or fortresses that the Moors built in Spain. The Alhambra began its life in the 13th century, the era of the Nazari dynasty, commissioned by Muhammad l and was occupied constantly until the Moors lost their final foothold and surrendered to the Catholic Kings in January 1492. The fortress walls encompass The Generalife Gardens which were built as a summer garden and palace for the emirate with The Court of the Water Channel, a long perfectly symmetrical pool with fountains to cool the summer days and nights. It´s said to be one of the best preserved mediaeval gardens in the world. It seems that Mary Lee Settle was standing in these gardens contemplating what was before her and remembering the Islamic art and architecture she just seen when she wrote her statement quoted above. This is another fairly unknown castle of Andalucia, dropping down to the plains near Guadix and cherry tree lined roads the four round turreted castle of La Calahorra is unexpected. Perfectly symmetrical, neatly placed and in good condition its position seems odd with the Sierra Nevada mountains as a backdrop to the flat brown plain with a superb fairyland castle on top. It is only open on Wednesdays but if you visit on any other day, ask for Antonio the key holder and he will show you around for three Euros.